With Emperor Akihito abdicating on April 30, the Heisei Era that began Jan. 8, 1989, after his father’s death will also come to an end. With this column I’d like to look back at some of the noteworthy changes that occurred to Japan’s laws and legal institutions during the past three decades. Believe it or not, it was not until the passage of a 1999 statute that Japan’s national flag and anthem achieved official legal status. In 1989, Japan’s courtroom lawyer population was about 13,500 and just 5 percent were women. By February 2019 this number had risen to 41,000 and 19 percent were women; an increase but still not an impressive male-female ratio compared to other developed countries. While the number of people allowed to pass the national bar exam was gradually increased starting around the beginning of the Heisei Era, the real growth came with the introduction in 2004 of a new law school system of graduate professional schools dedicated to producing lawyers, judges and prosecutors with broader and deeper training. It has been an unmitigated policy disaster (trust me!) but has at least resulted in more lawyers and more competitive pricing for their services. The period also coincides roughly with the appearance of registered foreign lawyers, though the relevant law dates back to 1986. Authorized to advise on foreign (but not Japanese) law, the registered foreign lawyer population is currently about 440. Prewar Japan had a jury system, under a law technically still on the books (it was suspended during the war but never resuscitated). American-administered Okinawa did too, until its return to Japanese administration in 1972. The postwar occupation period also saw the introduction of Prosecutorial Review Commissions: panels of randomly selected citizens that can second-guess decisions not to prosecute crimes. For the first six decades of the postwar period, however, trials were decided by a comparatively small number of cloistered professional judges. This changed in 2009 with the introduction of the saiban’in (lay judge) system. Trials of serious crimes are now decided by a mixed panel of three professional judges and six citizen judges chosen randomly from eligible voters. Unlike American juries, though, lay judge panels participate in sentencing decisions. In fact, the majority of trials under this system have involved defendants freely admitting their guilt, thus they’ve primarily been about deciding punishment rather than determining guilt or innocence. Interestingly, the court with the most trials of this type under its belt is not in Tokyo. This distinction goes to the Chiba District Court, reportedly because of the many cases generated by people trying to smuggle drugs into the country by way of Narita airport. Lay judge trials account for a small percentage of total criminal trials. Since its inception in 2009 through December 2018 a total of 11,541 defendants had been tried in this fashion. Only 5,261 contested the charges. 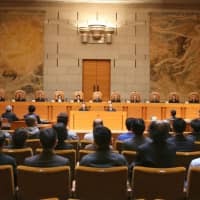 Hopes the new system would change Japan’s infamous 99.9 percent conviction rate were misplaced, and lay judge trials have rendered a grand total of only 99 acquittals, some of which have been overturned on appeal. Though, perhaps they have also been merciful, rendering only 35 death sentences. While the overall number of lay judge trials has not been large, the system’s introduction has had a significant impact. There is greater public interest in the criminal justice system and legal professionals have had to put more effort into making the trial process comprehensible — and convenient — to the lay participants. If you measure judicial restraint by the frequency with which a court overturns legislation, Japan’s Supreme Court is almost comatose, having only found statutes to violate the Constitution 10 times in the seven decades since its creation. Moreover, the first such ruling of hōrei iken (a law violating the Constitution) did not come until 1973. Half of these rulings were issued during the Heisei Era and, significantly, two involved provisions of the Civil Code: For decades the code seemed to trump the Constitution when the text of the two conflicted. 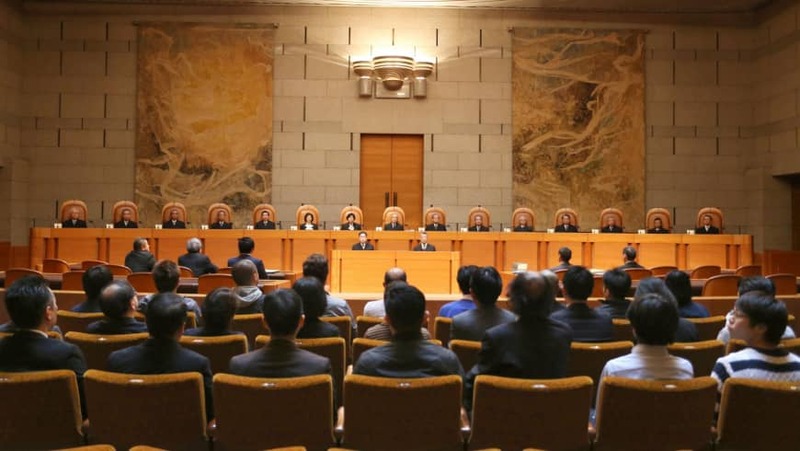 During Heisei, the court also seems to have become more assertive in crafting remedies, accepting new legal theories and signaling the Diet that it is not doing enough to legislatively implement the nation’s charter. The court has also issued a dozen less-famous rulings finding state action to violate the Constitution, though the law underlying it did not. Interestingly, only two examples of such tekiyō iken (unconstitutional application) judgments were issued during Heisei. Both of these involved the entanglement of religion and public property. Japan began the Heisei Era in a strategic situation that constitutional interpretation had grown comfortable with, despite the severe constraints seemingly imposed on it by the famous Article 9. This provision prohibits the nation from having “land, sea, and air forces” — except for self-defense. This could be reconciled in a Cold War world where the principal task envisioned for Japan’s military was to fend off Soviet aggression until the U.S.-Japan security alliance triggered an American response. The increasingly multipolar 1990s and the “global war on terror” launched in the 2000s placed new demands on America’s military allies, including Japan. Embarrassed by its “checkbook-only” participation in the 1990-91 Gulf War, Japan sent its Self-Defense Forces to Iraq in 2003 but only in supporting roles and unarmed. Japanese naval and air components played a similar role in Iraq and other aspects of the war on terrorism. The Cabinet Legislation Bureau, one of Japan’s most powerful bureaucracies, long held that the Constitution prohibited the use of Japan’s military abroad in collective self-defense activities with its U.S. allies. In 2014, Prime Minister Shinzo Abe was successful in using a combination of an unprecedented appointment to the bureau and a Cabinet resolution to change this long-standing interpretation. This was followed by a 2015 statute broadening the scope of permissible Self-Defense Forces activities and preceded by the state secrets act of 2013. The latter was creepy to civil libertarians but probably a basic requirement for Japan to expand defense ties with other prospective allies. The Cabinet deciding what Article 9 means also seems creepy but is the natural byproduct of the Supreme Court announcing way back in 1959 that it wouldn’t opine on such weighty matters. Thanks to these Heisei developments Japan is becoming a “normal” country militarily, with an aircraft carrier (farcically built as a “cruiser” with a flat deck oddly convenient for landing aircraft) and a prime minister arguing that pre-emptive attacks on North Korean missile installations would be constitutionally justified as “self-defense.” Nonetheless, Abe still wants to amend the Constitution to acknowledge the existence of the Self-Defense Forces. This would almost certainly facilitate passing the numerous other bits of mundane legislation that come with having a military, some of which are still missing in Japan. One of the more subtle but important changes during the Heisei Era was linguistic. The postwar Constitution was transformational in being written in vernacular Japanese rather than the archaic kanamajiribun form the average modern (or foreign!) reader might find to be difficult, consisting of a mixture of katakana, kanji and classical grammar accented by a complete absence of punctuation. Although statutes newly passed in the postwar period followed the Constitution and were written in modern language, many important laws predating the charter remained in this kanamajiribun form until well into the postwar period. The Civil Code, which dates back to 1896 and is perhaps the most fundamental law after the Constitution, was not fully rendered into modern Japanese until 2005! The Penal Code, first enacted in 1907, was similarly tweaked in 1995. The Code of Civil Procedure survived in its old form until being replaced by a new statute in 1996. The Commercial Code of 1899 has gradually been modernized — though in many areas by the wholesale removal of chapters that have been replaced by separate statutes (such as the massive Companies Act of 2005). At the time of writing, however, some parts of the code and other miscellaneous laws remained in the old language. The rendering of most of the corpus of Japanese law into a form that those who aren’t specialists can read and comprehend is a significant development. Much was written about the Japanese people’s supposed lack of interest in law without ever considering that in the past many might have simply found it a bother to try and read. Be honest, just reading the title of this section made you feel a bit bored, right? Still, a key legal development in the Heisei Era was the passage of the Administrative Procedure Act (APA) in 1993. The act established identifiable procedures that bureaucrats had to follow when exercising their powers. It was amended in 2008 to cover the infamous informal “administrative guidance,” once considered a part of Japan’s economic miracle. While constitutional litigation in Japan is famously unsuccessful, the APA coupled with 2004 amendments to the Administrative Case Litigation Act (which greatly expanded the scope of claims that can be brought in administrative lawsuits and the universe of plaintiffs who can bring them) have created a broad range of lower-key tools for challenging state power. Japan’s Code of Criminal Procedure was completely rewritten in 1947 to comport with the new Constitution. A retired judge once told me, though, that courtroom practices didn’t really change until the 1960s, because that was about when judges who had studied only the postwar laws and procedures started to have influence (the judiciary survived the postwar purges intact). The Heisei Era started roughly four decades after the end of World War II, by which time most people with experience under the old system likely would have retired from government service. With no prewar or Occupation-era education or experience to taint their views, whatever has happened to Japan’s Constitution, laws and institutions during the current Emperor’s reign is entirely a product of the postwar generations.